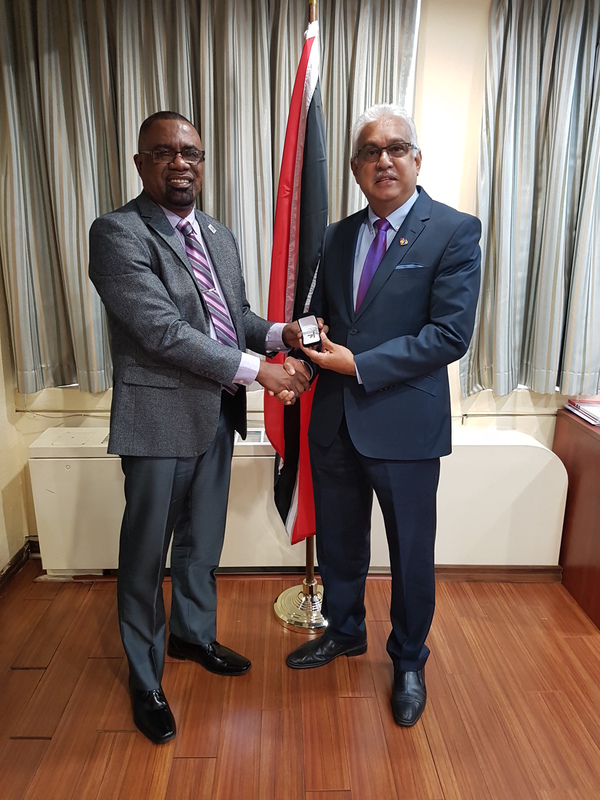 Honourable Terrence Deyalsingh, Minister of Health, Republic of Trinidad and Tobago was presented with his PANCAP Champions for Change Award by Mr Dereck Springer, Director of PANCAP, Monday October 23 at the Ministry of Health in Port-of-Spain. Minister Deyalsingh was unable to attend the Champions for Change IV – Relaunch held on September 12 – 13 in Georgetown Guyana, due to prior commitments. Minister Deyalsingh was recognised for leadership as a member of parliament advocating for the end of AIDS. Honourable Terrence Deyalsingh is the Minister of Health and the Member of Parliament for St. Joseph, in the Republic of Trinidad & Tobago. Before his stint in politics, the Hon. Terrence Deyalsingh started his career as a lecturer in the Institute of Training and Development (INTAD). From 2003-2006 he was a member of the Cabinet -appointed Committee on Labour Market Reform and chaired the sub-committee on Labour Market Information, all of which derived from his passion for business management. Subsequently, Minister Deyalsingh entered the realm of politics, where he served as a Temporary Opposition Senator during the 10th Republican Parliament. He was appointed a Senator on November 2, 2010 and served until October 14, 2013, when he accepted the nomination to contest the St. Joseph constituency. During this tenure in the Parliament of Trinidad and Tobago, he has served on the Standing Orders Committee of the Senate, as well as on the Finance Committee. Read more about the Champions for Change IV – Relaunch here.